LANSING — The race for an Upper Peninsula-based seat in the state House drew at least $431,857 this fall with about half of the money coming from Michigan Republican Party. In the Nov. 7 special election, the state GOP was hoping to flip the Democratic-leaning 109th state House District, which includes the city of Marquette. However, Republicans came up short. Democrat Sara Cambensy, a Marquette city commissioner, won the seat with about 56 percent of the vote. Republican Rich Rossway, who served on the Marquette school board, got 42 percent, and Green Party candidate Wade Roberts got 1 percent. The Michigan Campaign Finance Network’s tracking of publicly available disclosures shows that Republicans’ investment in the general election race — about $288,432 — doubled Democrats’ investment — about $143,425. The seat came open after the death of Rep. John Kivela, a Democrat from Marquette, in May 2017. Kivela was first elected to the state House in 2012. The entire special election — the primary and general combined — drew about $532,910 in contributions to candidates and spending by other groups, according to the Michigan Campaign Finance Network’s tracking of publicly available disclosures. There could have been additional spending in the race that fell outside of any reporting requirements. In most regular election cycles, the total of $532,910 wouldn’t place the race among the top 10 most expensive state House races. 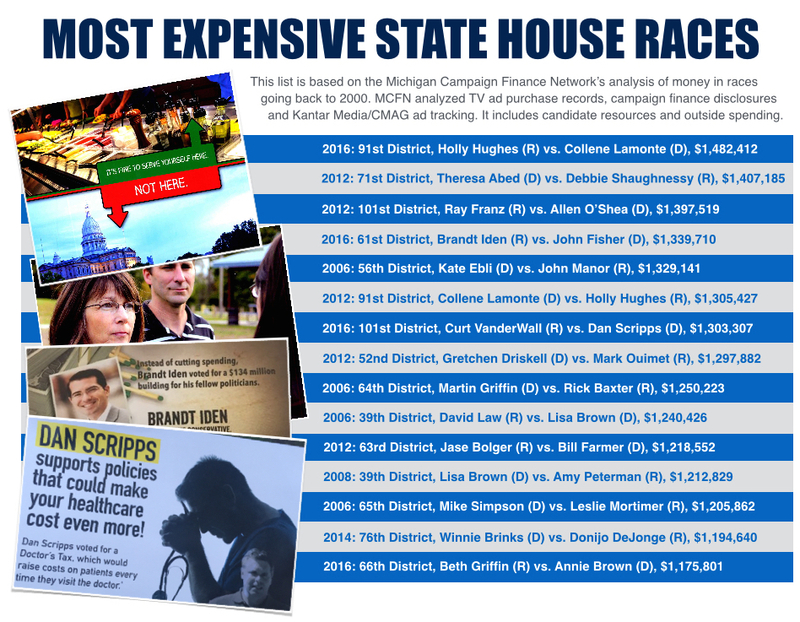 For the 2016 election cycle, the 10th most expensive state House races drew $877,784, according to MCFN’s tracking of money in the 2016 races. Cambensy reported $105,446 in financial support — direct and in-kind contributions — for the election cycle while Rossway reported $83,895 in support. According to her disclosures, Cambensy’s campaign received maximum contributions of $10,000 from the United Auto Workers of Michigan and from the Democratic State Central Committee, the Michigan Democratic Party’s committee. The Michigan House Democratic Fund, the fundraising committee of the House Democrats, and the Operating Engineers each chipped in $5,000. Rossway provided $12,221 in support for his own campaign. The Michigan Republican Party gave $7,500 directly to his campaign, and the Michigan Farm Bureau gave $4,000. 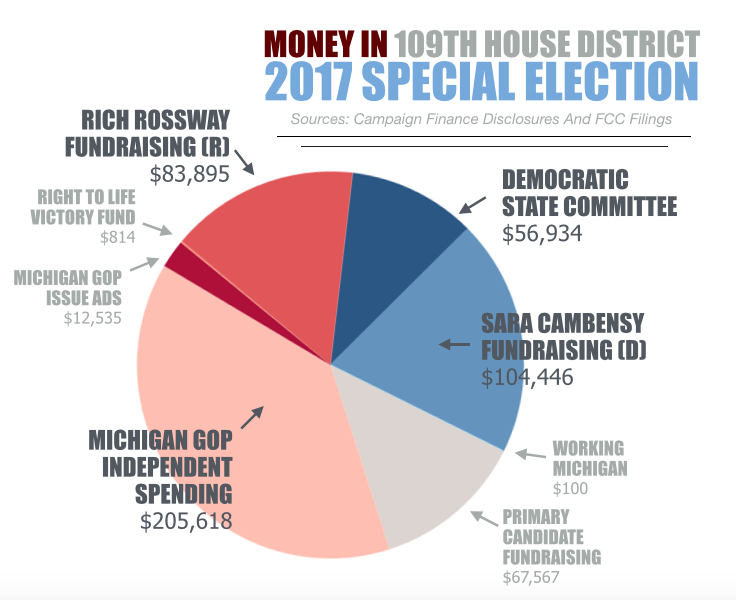 While Cambensy’s campaign raised more money than Rossway’s did, the Michigan Republican Party spent heavily on the race independently of Rossway’s campaign. According to its campaign finance disclosures, the Michigan Republican Party spent $205,816 on what it described as independent expenditures in support of Rossway, including spending money on radio advertisements, digital advertisements, mailings and robo calls. A review of Federal Communications Commission filings showed $12,535 in broadcast advertisements by the Michigan Republican Party. According to the filings, these ads were “issue ads” meaning they didn’t expressly tell voters to support Rossway or oppose Cambensy and meaning they didn’t necessarily require disclosure under Michigan’s campaign finance laws. The Right to Life of Michigan Victory Fund also disclosed spending $814 either in support of Rossway or in opposition to Cambensy. On the Democratic side of the race, the Democratic State Central Committee reported spending $56,934 in support of Cambensy, independent of her campaign. And Working Michigan, a labor-backed Super PAC, reported spending $100 in support of her. In addition to Cambensy, there were three other candidates in the August Democratic primary. Tom Curry reported $3,397 in support. Joe DeRocha reported $26,536 in support. Jeremy Hosking reported $37,634 in support. The special election in the heavily Democratic 1st state House District in southeast Michigan wasn’t an expensive one. The winner of the race, Tenisha Yancey, a Democrat from Harper Woods, reported raising $63,666 for the primary and general elections. She got about 71 percent of the vote in the November general election. She provided $18,000 in support for her own campaign, according to disclosures. Her other top donors were the United Auto Workers, which gave $10,000, and the Michigan Regional Council of Carpenters, which gave $3,500. Her general election opponents, Libertarian Gregory Creswell and Republican Mark Corcoran, both received waivers from campaign finance reporting requirements because they pledged not to raise or spend more than $1,000 for their campaigns. MCFN didn’t track any significant independent spending in the general election race. Yancey faced 10 Democratic opponents in the August primary election. They combined to raise $117,029 through direct and in-kind contributions. Attorney Pamela Sossi, who finished in second place in the primary, raised the most money of Yancey’s primary opponents at $38,843. Yancey got 33 percent of the primary vote. Sossi got 30 percent.